If you are thinking about making a major update to your bathroom this year, you’ve chosen a good time to do it. There are a lot of exciting and beautiful trends that are hitting the design world nowadays, and you’re sure to be pretty excited about some of them. These are just a few of the bathroom decorating trends that people are loving this season and that will look amazing when implemented in your home. Wood is obviously a timeless building material, but it’s one that you probably haven’t seen in a lot of bathrooms until lately. Luckily, this year’s designers are showing off the beauty of wood by installing gorgeous timber flooring, timber shelving and more in bathrooms. 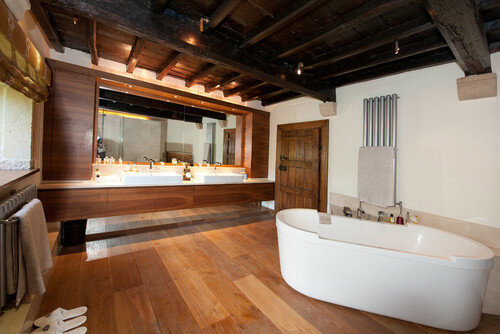 You can enjoy the beauty and durability of wood and give your bathroom a timeless look by implementing timber in this way. Transitional Bathroom by Yorkshire And The Humber Interior Designers & Decorators Carolyn Parker Interior Design Ltd.
Gone are the days of the tiny, cramped bathtub-and-shower combinations. According to the Renovation Kingdom website, now is the time to install a beautiful, state-of-the-art frameless glass shower with all of the bells and whistles, such as a natural stone floor and surrounding wall area, luxury jets and more. Also, consider a large, whirlpool bathtub with jets; then, you can get a luxurious, spa-like experience while at home. For a few years, people weren’t really using tile in their bathrooms as frequently as they used to. However, tile has really made a comeback, especially this season. When searching for tile, skip the boring whites and light neutrals. Instead, opt for dark tiles in beautiful shades of blue, dark grey, dark green and black. Then, you can enjoy a timeless look that is sure to match any decor that you choose for your bathroom. Grey is the new neutral. Skip the boring white walls, and opt for a beautiful shade of grey instead. Grey is highly functional, doesn’t show dirt as much as white and looks great in any bathroom. Plus, you can play it up with both lights and darks; for example, try pairing a grey wall with bright white trim and dark accessories. Contemporary Bathroom by San Antonio Interior Designers & Decorators Dy Lynne Décor, Inc.
Florals aren’t just in your grandmother’s house anymore. Beautiful floral touches are showing up in a lot of bathrooms this year, possibly because of the springtime feel. Use paintings or pictures of flowers to decorate your bare walls, and consider giving your bathroom a perky feel with a bouquet of fresh flowers in a simple mason jar or vase. Bathroom faucets and showerheads have come a long way over the last few years. Many have state-of-the-art automatic temperature control settings, are more water efficient than ever before and have a beautiful, shiny look that can instantly wake up your bathroom. Now is a great time to get started with improving your bathroom. If you’re looking to make a difference in your bathroom, try one or all of these top spring design trends for 2015. Thanks so much for the kind words. Always good to hear from other designers from around the globe. Me too! People are so afraid to have wood floors around water. I have found that engineered wood floors are the perfect choice for this application because they are more resistant to moisture due to the substrate they are applied to is layers of plywood running in different directions giving it more strength. The tiles, fun floral and the timber used for the bathroom design was amazing. It looks luxurious. Thanks Rosy, I think floral arrangements add color and fresh aromas to any room. Thanks! I am glad you found it informative. I am glad I have inspired you.